Wow, it's been a busy week. 53 listings hit the market in Boulder this week, 7 of which are already under contract. As I'm writing this, it's nearly 6pm on a Friday night. I've been a little busy negotiating on a contract and I still have to get my run in so I'm going to skip the usual Friday inventory run down. Instead, I'll give you only my picks. 790 10th Street - Start Working on Your 3Pt. Shot. Of the 53 houses hitting the market, 10 are worth seeing (and still available). These are Osman's picks for the weekend of April 18th. Here's the full list. Individual property's and notes are below. Call me to see any of the following properties. ph: 303.746.6896. 3461 28th Street - Nice 2/2 in a decent location. Possible investor play or CU kiddie condo. 1634 17th Street #9 - I generally don't recommend 1 bedroom units for investment purposes but this one is in a killer location. It's tiny, but would rent very quickly. For people who occasionally visit Boulder or would like a low impact, minimal lifestyle, this could be a good choice. 2932 Shadow Creek #108 - Gold run is ideally situated on the bike path and near CU. Units are very easily rented to undergrads and grad students alike. A quick hop on the bike and you're downtown, too. Due diligence tip: there have been several fires in Gold Run in recent years. Read the HOA docs. 70 Benthaven Place - I could have sworn this has been on the market recently, but perhaps it was another one on Benthaven. Devil's Thumb is very desirable for families and has the best schools in Boulder. This unit could be a reasonable choice if you've got children and you're not into doing your own maintenance. 711 Hawthorn Ave - I don't normally post about vacant land in Boulder because, frankly it's not that common and most of my clients aren't interested in building their own. This particular location is spectacular, however. You're right next to the Community Gardens and in central Boulder. If you're willing to take construction risk, this is a plot worth considering. 3822 Lakebriar Drive - This unit could use some updates, but the location is spectacular. There's a shortage of higher quality attached dwellings in Boulder. This could be a great choice for Baby Boomers looking to downsize. 2248 Nicholl Street W - Solid location, decent finishes, reasonable layout. Looks turnkey. 1989 Beacon Ct - Now we're talking. This location is ideal for strolling to downtown or hitting the trails. West Pearl is very desirable and these town homes are distinctive. 790 10th Street - Historic but already updated and in a great location only a block from Chautauqua. 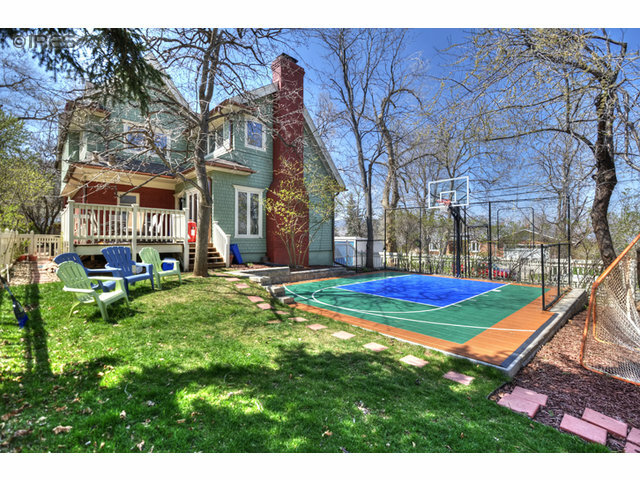 I'm not sure about the basketball court but it's a quirky conversation piece, if nothing else. If you buy it, I'll knock off (rebate) a half point on my commission if you can win a one on one with me. Ok, best of three. 3500 4th Street - This house was on the market a long time in 2009 and 2010. The asking price started at $1.9 before falling to $1.5. Back then, I took a few clients to see it and after serious consideration, we passed on making an offer. It's now back on the market at $2.0. I'm not sure what's changed or whether it's been updated. Has it appreciated that much? I'd need to see it in person (again) to find out. I'm in town this weekend, so feel free to call me if you'd like to set up a showing on any of the above properties. ph: 303.746. 6896. Happy house hunting!